I love PledgeMusic. It puts the future of music back into the fans’ hands and gives us the opportunity to show the music industry what albums we actually want to see being made, rather than being force fed commercial music (or as some might say) a load of crap. In our house,we have long been fans of The Wildhearts. Our eldest son is named after their former bass player, Danny McCormack. Danny even made a special appearance at a charity fundraiser for Little Hearts Matter, a charity that really helped us out when our son was born with a serious heart condition, Hypoplastic Left Heart Syndrome. I am so grateful to him for supporting us at this difficult time. 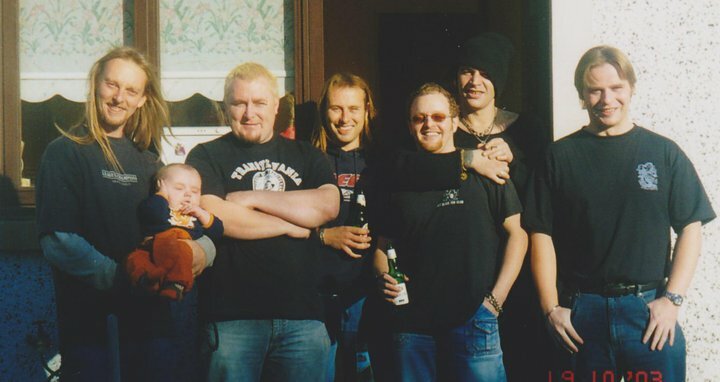 As well as watching The Wildhearts play all over the UK, Dave and the rest of his former band, Concrete Beach, once met the band and went for a night out with them (minus Ginger) whilst they were recording at a studio in Wales- a fact that he impressed me with when I first met him! Apart from my “Danny story” (which was amazing as he came to my mum’s house and everything! Yes! Danny McCormack in my mum’s actual house!) my other Wildhearts “claim to fame” is not so glamorous in fact it is damnright embarassing! I got extremely drunk at a Ginger gig and didn’t want the music to end. It was around the time when if we shouted to Concrete Beach to give us an encore then, of course, they would give us one (an encore! ), therefore I naively expected Ginger to also give us fans what we wanted. We screamed for an encore and Ginger refused (looking back whilst sober and more, ahem, mature, I can see that he had probably given his all during the gig and was too bloody knackered to give us anymore! Fairy-nuff!, But no! In my drunken state, it was a travesty! Dave and our friend, Rayleigh had spent months organising the tickets and transport for everyone, we had travelled over three hours to see them play and I wanted more than my moneys worth. Before he had the chance to tell me he didn’t mean it I was off, up onto the stage, barging past the doors to go backstage to tell Ginger to get back on stage “for Dave and Rayleigh”! You know when you’re in a drunken haze and nothing actually makes sense? I really thought that Ginger would know who they were. I explained about the night out the Wildhearts had enjoyed in Pembrokeshire, forgetting that Ginger was not even there! In short, I looked like (and indeed was) a drunken, crazy, deranged fan! Oops! Anyway, all was quiet on the Ginger and the Wildies front for a sad, short while. We followed and kept up with other projects that various band members went into, but it just wasn’t the same. So, imagine our exitement in August 2011, when Ginger Wildheart launched his Pledge Campaign to make a Triple Album. I’ve never seen Dave get his debit card out so quickly before! Ginger’s PledgeCampaign was a massive success. It made history. He hit 100% of the funding total within six hours of launching. Three days later, the total reached 555% and the hard copies were permanently withdrawn. 555% went on to become the name of the exclusive Hard Copy of the Triple Album that us pledgers received. It is a beauty of an album. When we were sent ours, I drove down to the beach and sat for hours listening to every song and reading the lyrics over and over. It was an immediate hit with the kids too and for months all we listened to was Ginger 555. A one CD Twelve Track album was released to the general public, entitled 100%. The week 100% was put on general release it got to number 9 in the mid-week UK Album Chart. Not bad for a crowd funded album, hey?! If you don’t have a copy- buy it– it’s one of those albums that everyone should have in their collection. It is terrifying to think that without PledgeMusic 555% and 100% may not have existed! On 3 August (a day before my birthday!) 2012 Ginger did it again. He launched the Mutation and Hey Hello! projects. Hours later the project was again once fully funded! The Download is available to Pledgers but the CD is still being manufactured- official release dates are still to be confirmed. PledgeMusic has served Ginger well and allowed him to more than reach his goal (10% of any money raised after the goal goes to Imagine charity by the way), but how easy is it for smaller local bands to reach their target? You can read about My Favourite Band: Hate Gauge in the linked blog post. The boys have been gigging in various bands over the years for as long as I can remember- One Room Down and Concrete Beach to name a few. In fact, their current drummer, Tom Lewis, wasn’t even born when the lads started gigging. As well as holding down full time jobs – because bills need to be paid and kids need to be fed, you know- the band spend hours every day either writing songs, practising, gigging, making videos, organising tours, designing artwork, making posters, recording their own stuff or travelling in the van to the aforementioned gigs. I love how the B*Movie Heroes song “One Rung Up from Misery” describes perfectly how being in a “local” unsigned band is awesome, but it is also relentless. The good bits are- you’re in it because you want to be, it’s your life choice, you’re independent so you can do what you want, you have complete creative control and that is incredible. Your fans are loyal. They follow you because they know that you’re amazing, not just because you’re famous or the next big thing. You still get that Rock Star buzz. You may not be playing Wembley, but if you’re filling your local pub or Rock Club it’s still success. Even quieter gigs can be magic. Maybe to smaller bands, it’s actually the quality of the fans that matters more than the quantity. If everyone one is eating out of your hand and wanting more then numbers don’t matter. At that moment in time- you’ve made it! 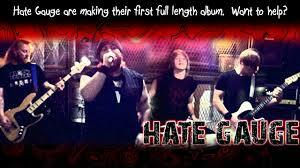 So far, as Hate Gauge, the band have only released mini albums, but the fans want more. After all these years on the local music scene, there should be, deserves to be, a full length album. Ginger raised his goal in under six hours. There are just five days left on Hate Gauge’s Pledge Campaign and they have yet to make their goal. Many people have “Pledged to Pledge” and not got around to doing it yet, if that is you, then this is your friendly reminder! If you would like to help a band achieve their goal – not to mention get your own copy of an amazing album- then you can pledge from as little as £8. My favourite value option is the £15 one. You get a signed CD and your name in the liner notes so it feels pretty special. If you win the Euro Millions this Friday (we can all but hope!) then why not pledge £250 for your own Private Acoustic Gig (that is a pretty good bargain actually!). If you have no pennies but appreciate hardworking bands in the industry, then why not follow Hate Gauge on Twitter and Facebook to show support in that way. Every little helps and is appreciated! It feels amazing to listen to a brand new album, but it is a million times more epic than that when you’ve been a part of making that album happen. Next Post I’m going to Brit Mums!